From left, Chris Muhr, head of U.S. at Auto1, with founders Christian Bertermann and Hakan Koc. (Bloomberg) -- In summer 2012, Christian Bertermann was a frustrated young man trying to get rid of two old cars that belonged to his grandmother. Bertermann, 31, an Internet specialist in Berlin, had recently quit his job at Groupon Inc., and along with fellow entrepreneur Hakan Koc wanted to set up his own company. Spurred by Bertermann’s inability to find a dealership to both value and sell the vehicles, the men created an online business to fill the gap. The venture, now called Auto1 Group, was valued at more than $1 billion in a financing round earlier this year that raised $100 million. Its owners are now seeking $500 million more in debt and equity as they target international growth. Koc declined to comment on how the new round of funding might value the company, pointing instead to the fact that monthly revenues have tripled to $70 million since the last valuation. The company’s annualized revenue run rate is about $850 million, he said. 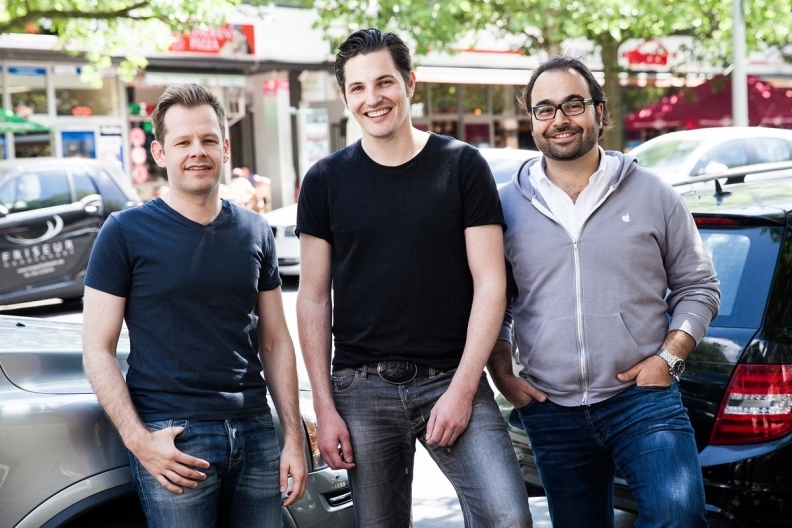 Auto1, based in Berlin, values and buys used cars from individual sellers based on its own inventory and that of dealerships and manufacturers that use its platform. It then sells them on for a higher price to dealerships. Where Auto1 differs from most online marketplaces, Koc said, is that the company uses its own cash to buy the cars and store them until they are sold to dealers, speeding up the process for sellers from an average of 90 days in Europe to about 10 days. The international market for used-car sales may be worth about $1 trillion, they said. Koc, also 31, worked at Rocket Internet SE and Home24 AG before joining Bertermann, both also Berlin-based startups that have come to prominence in recent years as Europe’s technology industry grows. Venture capital-backed European technology firms raised $2.5 billion from 264 deals in the first quarter of this year, led by Delivery Hero Holding GmbH’s $110 million fund raising, according to venture-capital researcher CB Insights. That’s 98 percent higher than the same period in 2014 and a 21 percent rise in the number of deals. Auto1’s founders met when they were working in offices in the same building in Berlin. “Hakan was very funny and that’s why we started talking,” Bertermann said. The two men began having weekly dinners, trading notes about the highs and lows of their jobs. Both said they felt they had outgrown their companies and realized they could work well together. “When you’re looking for the next big challenge, you need a partner in crime,” said Koc, the more reserved of the pair. Almost three years on, Auto1 still counts Germany as its largest market with 35 percent of revenue. Koc declined to provide details on the company’s profitability, saying the core business was profitable yet they are spending significantly on international expansion, with the U.S. market the main focus. The used-car market in the U.S. “is quite fragmented,” both by sales and vehicle quality, James Albertine, an equity analyst at Stifel Nicolaus & Co., said in response to emailed questions. “There are many opportunities to grow,” he added. The story is the same closer to home. “It’s a huge market but there are very few that are less efficient,” Bertermann said. No one company operating in Germany has a market share of more than 1 percent, he said. Auto1 now operates in 20 markets. The single room in the heart of Berlin that housed six people when the company began has grown into four offices in the city that employ about 400. Investors in the business include DST Global, DN Capital, Piton Capital and Mutschler Ventures. Bertermann and Koc both tried setting up startups before Auto1. Bertermann’s venture was a voucher website similar to Groupon, but when he saw how well his company’s rival was doing he took a job there instead. Koc began a social networking payments platform while still at law school. Its failure, he says, taught him you can’t start a business alongside a day job, and that you shouldn’t overestimate the number of young people that own smartphones. After the false starts, focusing on Auto1 has yielded success. Bertermann now whizzes around in a 1987 Jaguar XJS V12, while Koc drives a 2008 Mercedes GLK 350. The cars that belonged to Bertermann’s grandmother, a Mercedes 190 and a Golf IV 1.6, meanwhile, were sold to a dealership that became Auto1’s first partner.